A new update to GOG.com's website has revised its gamecard layout, added DLC sorting, and more. As a digital games distributor, GOG.com is already well-loved by fans and DRM-free proponents alike. True, its services aren't as robust or extensive as competitors like Steam, but as its latest website update shows, the company continues to make progress. Among the most recent changes are improved DLC sorting features, and gamecard revisions that better emphasize trailers and screenshots. By far, however, the most significant change is the addition of ongoing series bundle deals. GOG.com usually provided bundle deals as the occasional weekend or special-event discount, but these franchise-encompassing packages are now permanent features for the website going forward. 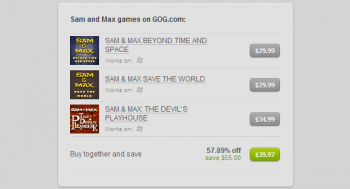 Over 80 bundles are currently available for purchase, including a 16% discount on the Neverwinter Nights games, 34% for Deus Ex and Invisible War, and a whopping 58% for the complete Sam & Max series. Each bundle is linked within individual game pages, allowing users to view all available entries series before tossing them wholesale into your cart. It's certainly a welcome addition to the website that's been a long time coming, although I have to admit it's not going to help trim down my gaming backlog anytime soon.